The following is an excerpt from The Legacies of a Hawaiian Generation. Author Judith Schachter remembers a friendship that began at a May 1989 meeting of the Waimānalo Senior Citizens Association. 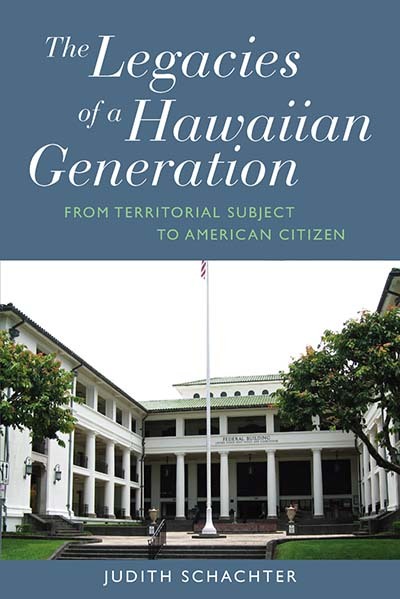 The Legacies of a Hawaiian Generation by Judith Schachter is now available in paperback. John Simeona stood at the front of the room, leading the pledge of allegiance. A rendition of “Aloha `Oe” followed, the seniors joining in song as assiduously as they had recited the pledge. John ran the meeting, and introduced me at the end taking on the responsibility of communicating my message in their words. She is interested in Hawaiian custom, he said, and the “ways of old.” Then, after the meeting ended, he spent forty-five minutes talking story into my tape recorder. Several years after we met, he added a typed document to the stories he had already provided in hours of talk, tape recordings, and letters. The “book,” as he described it, was called Life Story of a Native Hawaiian, and the subtitle read “100 percent Hawaiian.” John’s reference to a percentage recalls and rejects the US government’s categorization of Native Hawaiians as a racial group, with blood quantum taken as the measure. By referring to the percentage notion, John acknowledged the power of an imposed racial definition in his life. By claiming “100 percent,” he asserted that being Hawaiian, acting Hawaiian, and practicing Hawaiian “ways” meant something radically different. The phrase points forward to his identification as a Native Hawaiian man. The process of identification through an enactment of Hawaiian values persisted even as he engaged in the institutions established by an American colonial regime. From his childhood in the Homestead of Keaukaha, on the Big Island, to the last years of his life in the Waimānalo Homestead on O`ahu, John brought the lessons of his ancestors to bear on practices and injustices that are the outcome of US governance. Hapa translates as “half,” and the common usage in Hawaii is hapa haole: residents of the islands whose background is half Caucasian and half Hawaiian. Over time, the term hapa grew to include other locals, shedding the one-dimensional racial significance of whiteness. The change softened the colonial impact of the designation. Critics claim that hapa haole resembles “Hawaiian at heart” with its superficial embrace of Hawaiian culture. For John, however, hapa was positive, a sign of flexible identities. When he called me “hapa Hawaiian,” he reversed the negative attributions of hapa by assuming I could learn the processes that produce identification as a Native Hawaiian person. For him, hapa represented an apprenticeship to experts in culture teaching. I could learn to act according to Hawaiian cultural norms by listening to the elders. “Be quiet,” he instructed, “and wait for the stories.” In granting me the possibility of moving between identities, from malihini anthropologist to familiar pupil, he mimicked his own life story. For over seventy years, he had worked at juxtaposing the behaviors that represented being Hawaiian with those that demonstrated his acquisition of American teachings; he learned how to practice the right culture at the right time. Hapa was no more a portion or fraction than was 100 percent a fixed totality. As individuals judge and measure Native Hawaiian and American influences in their everyday lives, the components are inevitably in flux, reflecting shifting relationships. 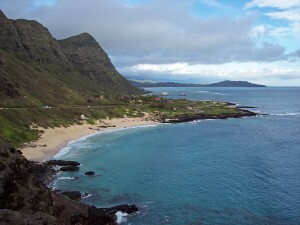 John and I sat at his favorite Waimānalo Beach for hours, talking story. We sat in between, under casuarina trees that separated dry land from the sea. Eventually we crossed the highway—named after Prince Jonah Kūhiō Kalaniana`ole—that separated the beach park from homestead lots. I met his sister, Auntie Eleanor, the political actor in the family, participant in the cultural renaissance in the 1970s, Department of Hawaiian Home Lands commissioner in the 1980s, and self-defined activist in the 1990s. She was “Auntie” but John was never “Uncle” for me. He had initially defined our relationship as an equal exchange of information; we were, in his words, first partners, then collaborators, and finally good friends. “Aloha Pumehana,” he began his letters, that means “greetings with affection,” he explained. The first self-reference he offered me persisted throughout the years I knew him. When I met Eleanor, I was already pupil, learner, and familiar; “Auntie” suited our relationship from the start. John and Eleanor opened a space in the `ohana for me. In different ways, each member of the family welcomed the visiting anthropologist. I was welcomed “home” and I did, in a fashion, belong to the `ohana, but I also slipped back and forth across boundaries: I went home to Pittsburgh every year. John kept these crossings in our minds when he used the term hapa. To belong, in the Native Hawaiian culture, means acting with concern, generosity, and involvement. For some people I remained the inquiring anthropologist, and those individuals provided information on the persistence of custom in a modern state. For others I became pupil, a person who could learn Hawaiian ways of life by listening and watching. John welcomed me, a stranger from the nation that had taken over an existing lāhui (nation), seized acres of land. Our conversations crossed over this intersecting history, and we exchanged interpretations of the role of the US in Hawai`i. John interpreted American presence through the lens of a public school education, his time in the Army, and his job at the Pearl Harbor Naval Shipyard. In the mid-1990s, he sent me letters carefully assessing the sovereignty movement in terms of timing, responsibility to the people, and the debt the US owed Native Hawaiians. Eleanor was more critical in her talk, appraising the outcome of the federal government’s Hawaiian Homes Commission Act, recalling her protests against military appropriation of acreage, and arguing for revisions in the American judiciary system in Hawaii. The stories I heard from them deny the simplicity of a historical narrative propelled by colonial intrusion and indigenous opposition. Writing alters the power of the word, freeing expression from the constraints of oral communication and opening the way to an assertion of individual viewpoint. Eleanor put it clearly one afternoon: “all books are a person’s opinion.” She referred to the book she knew I was planning to write—a warning, perhaps, or more likely a lesson. And she presented a challenge: to assert a point of view without making oneself the central subject of the story. Guided by John and by Eleanor, my story reflects the knowledge/learning of the grandparental generation and also kūpuna, “elderlys” (in John’s word) who possess wisdom. These kūpuna play a crucial role in the “transmission of cultural heritage” for Native Hawaiians. At the same time John and Eleanor are part of a social generation, individuals exposed to the same historical events and the same intrusions by the US into their everyday lives. John initially introduced me to members of this generation, siblings and cousins he recommended as “experts” on Native Hawaiian culture. The elderlys accepted a burden, a kuleana or responsibility to the youth who would inherit new stories and social contexts. Defined by a relationship to predecessors and successors, not by kinship or age, `ōpio (youth) turned to the elders when, in the 1970s, historical circumstances gave birth to a Hawaiian cultural renaissance. John’s Life Story ends: “I love everybody in our surroundings, my family, my friends and our good Lord for giving me this privilege to put all I know about my livelihood, my knowledge, my learning, my good attitude and all the good things I know from my past and from my present experiences. I hope that my family will do the same for their families, when they get as old as I am.” In my book, I try to fulfill the task John gave his `ohana and that his generation gave the next. Judith Schachter is Professor of Anthropology and History at Carnegie Mellon University. Her publications include Kinship with Strangers: Adoption and Interpretations of Kinship in American Culture (University of California Press, 1994), A Sealed and Secret Kinship: The Culture of Politics and Practices in American Adoption (Berghahn Books, 2002), and The Legacies of a Hawaiian Generation from which this excerpt is taken and now available in paperback.